Newly planted and young trees need extra water during hot, dry summer months. You can help young trees flourish and grow by providing 25 gallons of water each week between the 4th of July and Labor Day. There are several different methods for watering young trees. Each way is effective so choose the method that’s most convenient for you. It is important to water newly planted and young trees regularly during the summer. 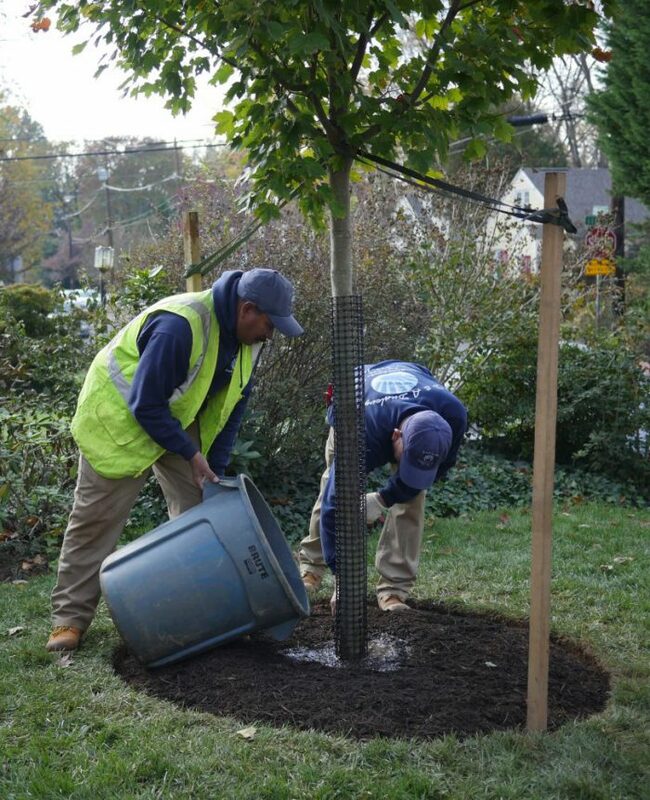 During the first six weeks after planting, your new shade trees need a lot of water! When they were planted, the trees were watered to settle the rootball, fill air pockets with soil, and provide moisture to the roots. 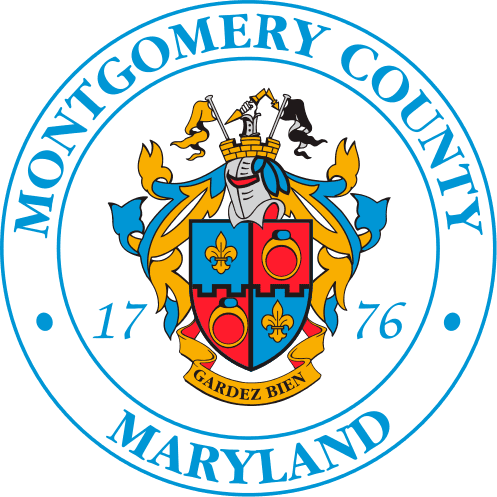 The Tree Montgomery program does not require that you water your new shade trees. However, if you can, it helps the newly transplanted trees establish healthy root systems and start growing. Now that your tree or trees have been planted we recommend that you follow this watering schedule during the first six weeks after planting. If it rains enough to soak the ground, you can skip the next watering. A soaker hose is designed to let water slowly seep out along the length of the hose. This saturates the soil around the tree by mimicking a gentle day-long rain. It’s convenient because you can leave a soaker hose in place during the summer. You can also cover the soaker hose with mulch to hide the hose and help disperse and conserve water. Check the hose regularly to make sure the water drips out gradually along most of the length of the hose. Water should not flow continuously from the hose; if it does, reduce the water pressure by turning back the faucet. For newly planted trees, place the soaker hose in the mulch ring. Water each new tree for about a half hour. For larger trees, place the hose in the mulch ring, or about four feet from the trunk, and leave the water on for about one hour. Timers to automatically turn your outdoor faucet off are available on-line or at lawn and garden shops. There are at least two ways to water using a garden hose. Water with a slow drip from your garden hose. Turn on the water, then turn the pressure down (nearly to off) so that the water slowly drips out – literally one drop at a time. This mimics a slow gentle rain. For recently planted trees, place the end of the hose in the mulch ring and leave the water dripping on for about an hour. For older trees, place the hose about four feet from the trunk and leave the water dripping for about one hour on one side, then switch the hose to the other side of the tree for another hour. Timers to automatically turn your outdoor faucet off are available on-line or at lawn and garden shops. Water newly planted trees from your garden hose without the nozzle. This mimics a summer rain storm. Remove the nozzle from the end of your hose. Using a watch and a bucket, determine how long it takes to fill the bucket as many times as needed for 25 gallons. For example, if you have a 5-gallon bucket, how long does it take the garden hose to fill the bucket 5 times? Once you know how long it takes, then water each newly planted tree, within the ring of mulch, for the time needed for 25 gallons. This generally does not work on hillsides because the water runs down the hill too quickly. Do not water with a spray nozzle or sprinkler from your hose – this gets water to the surface but very little gets below the grass to the tree roots. This is an easy way to make your own soaker. First, gathers some buckets or jugs and make sure they are empty and clean. Then pierce the bottom of each with 5-10 tiny holes to allow water to drip out gradually. For newly planted trees, place the full buckets in the mulch ring. For older trees, place the full buckets about 4 feet from the trunk. Check to ensure that they empty in several hours. Remember to refill your containers as many times as necessary to give your young trees 25 gallons of water. Also, we recommend placing rocks or a brick in the bottom of the buckets to keep them from blowing away or falling over. Gator bags use the same slow-drip technique as soaker hoses or buckets. There are several styles available on-line or at lawn and garden shops. Most are designed to be used on small trees. Read the label for how many gallons the bag holds. Install the gator bag and then fill it with water. Check to make sure the water empties in several hours. Refill the bags to give each tree 25 gallons of water during each watering. Remove the bag when watering is complete. If left on between waterings, these bags promote bacteria and fungus and can harbor critters, potentially causing problems for your trees. Need to know when to water? We’ll tell you. Tree Montgomery sends out watering alerts throughout the summer, on Facebook and Twitter. Follow @MyGreenMontgomery on Facebook and @MyGreenMC on Twitter for watering updates on Thursdays throughout the spring and summer.